Home » action figures , awesome duuuuuuude , brazil film , harry tuttle , movies , sillof , terry gilliam , toys » The Harry Tuttle action figure! The Harry Tuttle action figure! Good Lord... I would love for this thing to be mass-produced and sold somehow! There's a dude calling himself Sillof who excels at creating custom action figures, making replicas of movie props and all kinds of other uber-kewl stuff. Sillof has already achieved fame with his "steampunk" inspired renditions of characters from the Star Wars saga. 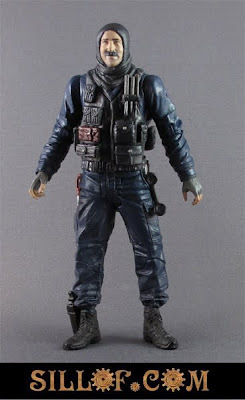 But check this out: Sillof has made an action figure of Archibald "Harry" Tuttle! Every detail of the renegade terrorist heating and air-conditioning repairman that Robert De Niro played in Terry Gilliam's movie Brazil has been reproduced: right down to the pistol and ventilation maintenance tools. Well done Sillof! And I can't think of a toy that more reflects what our society is becoming... or one screaming more to be made than this one. If I fill out a Form 27B-6, could you have Central Services make a copy for me?